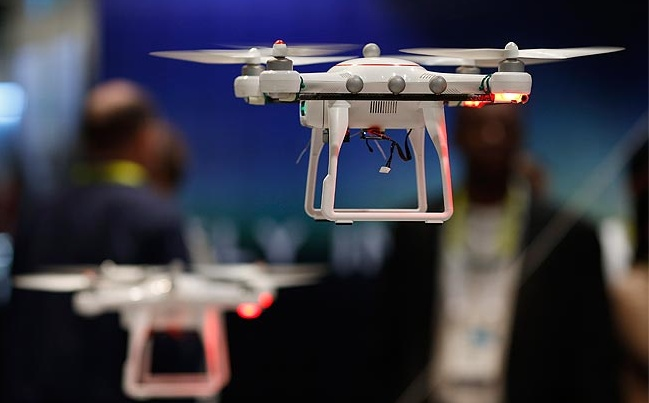 Drones are raising heads and concerns about their role at trade shows and events. Safety, legal and privacy issues have the event professionals wondering if drones at events are a fly-by-night fad or a must-have these days. Flying drones keep popping up in the meetings and events industry, allowing planners to create wow-factor experiential videos and virtual site visits. But while the new technology is undoubtedly awesome, its legalities are still murky. The future of drones for the event industry is truly up in the air. But, “drones are taking off,” says to Richard Reid, vice president of digital services at Freeman, the top meetings management company, . Brands in other countries have started taking advantage of drones even before they caught on in the United States. Camisaria Colombo, a Brazilian clothing store, attached mannequins to drones and flew them outside office building windows. There is also a florist in Italy that used drones to drop roses between strangers on Valentine’s Day. Drones do come with some concerns. Just ask the FAA! David Haas, director of digital solutions at event agency FreemanXP gave a warning about drone usage, “If they go out of control, most of them have four spinning blades. When you think about drone technology at an event, you have to be careful.” Singer Enrique Iglesias was involved in a recent accident and suffered serious lacerations to his hand after handling a drone on stage at a concert. According to conventionindustry.org, 205 million people in the United States attend “the 1.8M conventions, conferences, congresses, trade shows and exhibitions, incentive events and corporate/business meetings” each year. Then there’s the nearly 6 billion people in the world having a cell phone. While the future of drones at events is cloudy, it’s clear that people will be bringing their cell phones to events for a long time. Help keep event goers fully charged with a mobile charging station from a commercial charging station provider such as https://veloxity.us.